Robert Roberts, MD, has advanced health care throughout the world as a cardiologist who brought molecular biology and genetics to heart disease through his work co-discovering more than 60 genes related to coronary artery disease and developing the quantitative test that’s been used to diagnose heart attacks for three decades. A professor at the University of Arizona College of Medicine – Phoenix and holds the chair for the International Society for Cardiovascular Translational Research (ISCTR), Dr. Roberts is a renowned physician who has trained more than 400 cardiologists and was included in “Best Doctors in America” from 1985–2004. Dr. Roberts’ career as a geneticist and cardiologist includes leading the cardiology department at Baylor College of Medicine in Houston for 23 years and as President and CEO of the University of Ottawa Heart Institute, UOHI, where he completed two five-year terms. 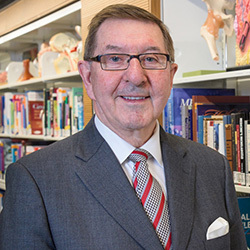 Under Dr. Roberts’ leadership, he founded and directed the Ruddy Canadian Cardiovascular Genetics Centre and established the Research Methods Centre. UOHI achieved world recognition for its research impact and ranked in the top two percent of 3,043 institutions worldwide. Among Dr. Roberts’ accomplishments, the most notable include developing the MBCK quantitative test, which has been the gold standard to diagnose heart attacks for three decades. He also discovered several genes responsible for heart disease, including the first gene for atrial fibrillation, WPW Syndrome and Coronary Artery Disease (9p21), along with co-discovering more than 60 genes associated with CAD. Dr. Roberts completed his undergraduate degree from Memorial University of Newfoundland, medical school from Dalhousie University in Halifax, Nova Scotia, and residency at Dalhousie University and University of Toronto. Dr. Roberts has furthered his training with multiple fellowships, including one in cardiology at the University of Toronto in 1971 and a research fellowship at the University of California, San Diego. In recognition of his worldwide reputation as an educator and scientist in the research and practice of cardiology, he has been invited to lecture throughout the world. Dr. Roberts, for 25 years, has been associate editor of Hurst’s The Heart, a leading textbook in cardiology. Dr. Roberts is editor-in-chief of Current Opinion in Cardiology, chief guest editor of the Journal of the American College of Cardiology (JACC) for basic translational science, section editor for JACC’s Genomics Section, associate editor of Cardiology Today and on the editorial board of 18 other journals. In recognition of his scientific contributions (over 900 publications), Dr. Roberts has received several prestigious awards, including the Distinguished Scientist of American College of Cardiology, election to the Academy of Science of the Royal Society of Canada and Outstanding Speaker Award for the American Association for Clinical Chemistry. Nabil Dib, MD, has conducted research and developed the newest investigational treatments for advanced cardiovascular disease for more than 25 years. He is director of Cardiovascular Research at Dignity Health and a professor of medicine at the University of Arizona College of Medicine – Phoenix. 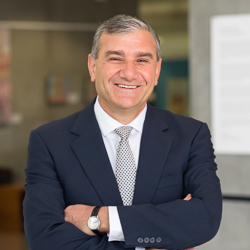 Dr. Dib is founder and president of the International Society for Cardiovascular Translational Research (ISCTR), which is based at the UA College of Medicine – Phoenix, and founding editor-in-chief of the Journal of Cardiovascular Translational Research. An interventional cardiologist, his experience also includes product development, including clinical and pre-clinical research. He has participated in more than 100 clinical trials involving Phase I, II and III. Dr. Dib invented and patented a drug and biologic delivery catheter that was FDA cleared and CE Marked in less than three years. He has been awarded seven patents for medical devices and participated in development of biological products that led to first-in-man approval studies. He obtained significant experience collaborating with industry in the fields of devices, biologics and pharmaceuticals, which included nine years of executive consulting for Cardiovascular Systems, Inc (CSI). He directed the strategic vision and clinical research for CSI in its development of an orbital atherectomy. For 20 years, he has collaborated with Johnson & Johnson and established a framework for pre-clinical and clinical research for the 3D-mapping system. He served as a national proctor on stem cell delivery. For Cardiometrix, Dr. Dib validated the Doppler flow wire in humans to assess the physiological significance of coronary artery disease. He also has served as an advisor for Abbott, Schering/Berlex, Boston Scientific, Volcano, and others. Early in his career, Dr. Dib realized the lengthy timeline and tremendous cost associated with the regulatory process in product development. In 2007, he founded the International Society for Cardiovascular Translational Research (ISCTR) with the main goal of expediting scientific discovery to patients. As an adjunct to ISCTR, in 2008, he founded the Journal of Cardiovascular Translational Research (JCTR), which is published by Springer/Nature and distributed worldwide. Dr. Dib has published two books: “Cardiovascular Translational Research” and “Stem Cell Therapy for Cardiovascular Disease,” and his research has led to more than 75 publications. He completed his interventional cardiology fellowship at Harvard Medical School, Beth Israel Deaconess Medical Center, Boston, and continued his education at Harvard School of Public Health, earning a master of science in epidemiology with a concentration on clinical trial design and cost effectiveness.